Cancellation Policy: Unless you have chosen the "non-refundable rate" which means no refund, the usual policy is 50% refund if cancellation made more than 30 days from arrival date. No refund if cancellation made within 30 days of arrival date. No-shows: No refund to guest. The innkeeper is paid as though the guest had stayed. WHAT’S INCLUDED. The prices quoted to you include accommodation for 2 adults with a warm breakfast buffet (served each day at 8 am). It also includes one uncovered parking space per room. Guests are welcome to use the common areas (2 decks, living room, dining area, and gardens) with quiet times from 9 pm to 9 am. Free wifi internet is included. We are happy to provide surge protectors for electronic devices upon request. A pool and hot tub are in process and not yet included. PAYMENT. The full amount is due as a deposit up front to hold your reservation. Hawaii excise and accommodation taxes (14.416%) will be added to your daily rate. ADDITIONAL PERSONS & BEDS. There is a $45 fee per night for additional guests. Only the Garden Room has the ability to host 2 additional guests. This covers the expense of extra linens and breakfast. If you are two persons or less (double occupancy) and request the extra bed to be made up anyway, there is an additional fee of $35 each time the bed is made up (usually every 3 days during your stay or upon request). CHECK~IN by hosts is between 3 pm and 6 p.m. Later check-in is also available, but guests will need instructions to find rooms. CHECK~OUT is no later than 11 am unless late check-out is available until 1 pm ($35 additional). NO PETS. We have one friendly cat on staff. Our cat is very friendly toward people, but has been known to attack dogs. NO DRINKING OF ALCOHOL IN EXCESS. A glass or two of wine, beer or champagne is welcome. Drunkenness is not welcome. Please be responsible and do not drink beverages over the white carpets. NO CHILDREN PERMITTED. Adults over the age of 18 are welcome so that you and other guests can enjoy the quiet atmosphere. Our home is not child-proof. KITCHEN is not available to guests by law. A common refrigerator, microwave and dry food storage is available in a common area only. We do not recommend having food in your room. DISABILITY ACCESS is limited due to the original structure of the home (stairs). CANCELLATION POLICY: Cancellation Policy: Unless you have chosen the "non-refundable rate" which means no refund, the usual policy is 50% refund if cancellation made more than 30 days from arrival date. No refund if cancellation made within 30 days of arrival date. No-shows: No refund to guest. The innkeeper is paid as though the guest had stayed. RIGHT TO REFUSE SERVICE. The Bed and Breakfast reserves the right to refuse to serve anyone if their presence at the Bed and Breakfast presents a nuisance to any other guest. If a guest is asked to leave for breaking any of the terms and conditions or for any other reason, the guests' payment will not be refunded. For example, if a guests arrives with a minor child or a pet or is smoking on the premises, the guest will not be allowed to stay. PRIVACY. We do not share your private information with anyone. EXCLUSION OF LIABILITY. The Bed and Breakfast cannot be held responsible for any loss, damage or theft on the property. Although we have never experienced theft so far, please take precautions by securing your valuables. We do not currently provide safes. We cannot prevent hurricanes or the damage they cause, and we cannot be held responsible for damages caused by acts of nature. Tropical insects are often large. We are not responsible for any injuries caused by centipedes or other insects/animals. For example, some guests are not accustomed to the noise that the frogs make at night and ear plugs are recommended if a guest is having trouble sleeping due to nature's symphony. Charming wild chickens and pheasants also roam free here, and roosters can sometimes be early risers. The Bed and Breakfast has made every effort possible to provide the quality and standards you would expect at a tropical B&B. If you have any reason for complaint while staying with us, please bring it to the owners’ attention immediately so that remedial action can be taken. The Bed and Breakfast does not provide wake up calls and is not responsible if you miss your flight. We caution guests not to rely on any electric digital alarm clock because sometimes power outages occur. The Bed and Breakfast and its owners may offer activities and equipment or encourage you to enjoy certain activities provided on the island such as swimming, hiking, biking and snorkeling. All of these activities are at your own risk. The Bed and Breakfast cannot be held responsible for any injuries you may sustain from any activity or equipment rented/borrowed from us. We recommend bringing or renting your own snorkel equipment from professional snorkel and dive shops so you can be properly fitted for them. We try to clean and maintain our equipment, however, this is only provided as a courtesy. The Bed and Breakfast cannot be responsible for any damages related to any pool or hot tub. Its use is at your own risk. No lifeguards are on duty. DAMAGES. The cost of any damages caused by guest activities shall be billed to the guest. For example, lost keys ($25), broken furniture, missing robe, coffee or red wine on carpet may need to be cleaned and/or replaced. The person responsible for the room will be billed accordingly. JURISDICTION. These Terms and Conditions shall be be governed by the laws of Hawaii. Any dispute arising shall be exclusively subject to these laws. Adventure, Romance, and Mermaid Retreats! A treasure awaits you — a magical getaway nestled romantically in the Kona coffee belt. Come for adventure, romance, personal retreat, communion with nature and mermaid encounters. Rest, restore and revive yourself in the clear blue waters of this Big Island and enjoy a quiet adult-only atmosphere. 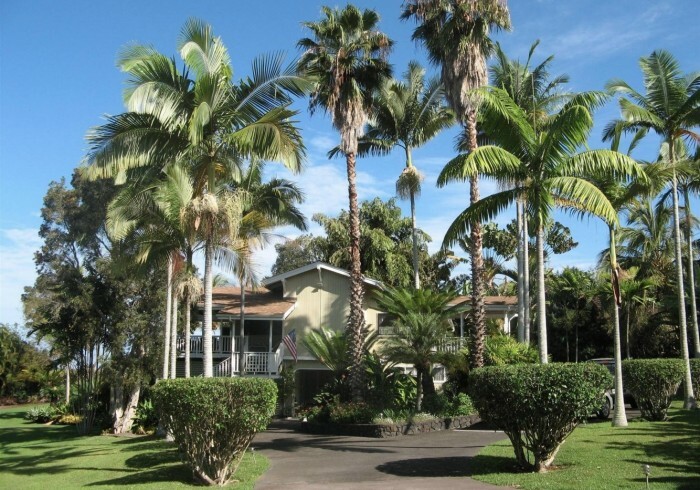 We were recently voted the best B&B in all of West Hawai'i! Let this beautiful land and 5 bedroom home embrace you in its Aloha and comfortable hospitality. It is a perfect getaway for those who want to experience Hawaii more intimately, without feeling like a “tourist.” Fall asleep to a symphony of crickets and chirping frogs and wake up to the sound of birds in our luscious gardens. Enjoy fresh fruits right off the trees. This quiet location offers small towns, delicious dining and quaint shops. 15 minutes south of Kailua. At 1204 feet elevation, we enjoy the cool breezes in the evening, tropical sun during the day and just a few minutes drive to 3 protected bays and beaches. Wild dolphins, turtles and snorkeling await you in these South Kona bays. The Kaawaloa Trail head to Kealakekua Bay is ¼ mile away from the bed and breakfast and a 1.8 mile hike to the ocean. Nestled in the coffee belt, many sacred sites such as the City of Refuge and Peace Garden invite your exploration. Dive into the clearest waters on the islands – at night with the giant Mantas and by day along the coastline. You are our honored guests, greeted with Aloha. Start your day with a healthy Hawaiian style breakfast featuring a different warm entrée each day, fruits and juice right from the garden. We’re happy to help plan your trip and share our beach gear, towels, boogie boards, etc. We also rent mermaid tails. Spend a day at Volcano National Park and see the lava flow. The Kona coast is full of adventure, history and culture. Unlike other islands, the big island is still uncrowded, friendly, slow paced and authentically Hawaiian. Let the spirit of Aloha soak in and ride the wave!